Eduard are a Czech based manufacturer famed for their model accessories. They have in the last few years released a successful range of kits. The weekend editions contain the plastic parts from the Profipack kit but without the mask, etch and with only 1 marking option. 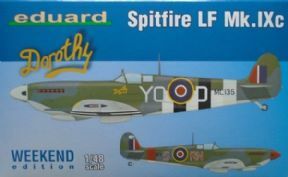 This kit is highly detailed and quite possibly the best ever Spitfire kit in 1/48. The kit comes with decals for two different aircraft.